As the Middle Eastern underground music scene continues to gain ground, we’re beginning to see more apps and sites that are supporting and showcasing these musicians. We’ve already told you about the Lebanon-based site, Sawt, which puts the latest Arabic Indie songs at your fingers, with an extremely easy-to-use interface. If you want something a little more elaborate, and with an iOS app to boot, check out MidEast Tunes. The site has everything from Saudi Arabian hip hop or Sudanese jazz, but there’s more to the site than that. While it showcases musicians from all over the Middle East and North Africa, the songs that are available on the site go a little deeper. All of the musicians who are featured on MidEast tunes are using their music as a tool for social change. MidEast Tunes has musicians from areas in the Middle East who have better opportunities for exposure, such as Egypt and Lebanon, while also giving the lesser known Kurdish, Iranian and Bahraini artists a platform to share their music with a global audience. The site currently features the music of over 400 bands and around 1,500 excellent tracks to listen to. 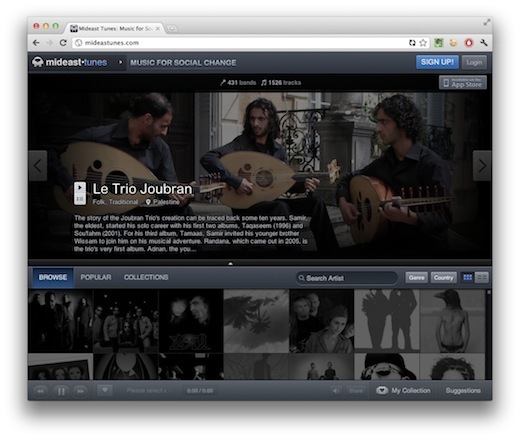 You can browse music on MidEast Tunes by artist or by genre. There are currently four genre collections on the site: Dance Mix, Awesome Alternative, Melancholic Symphonies and Arab Spring. You can also browse individual artists by location or genre, with the latter including everything from experimental to jazz to metal. Signing up for a free account allows you to create collections of your own, so you get to save your favourite artists. As you add more musicians to your collection, MidEast Tunes will make suggestions for you based on your taste. The slick iOS app gives you mobile access to all of the features available on the website. If we had one request, for both the web-based and iOS experience, it would be the ability to create individual playlists rather than save all your favourite artists in one collection. There is a ton of great music to be heard on MidEast Tunes, and keeping it organized by personal preference would be a welcome change. Both the website and iOS apps are beautifully designed, and offer the Middle East’s socially conscious musicians a unique opportunity to reach an international audience. The variety of music available on the site is impressive, and is the ultimate tool for anyone who wants to find out a little bit more about the best in indie music coming out of the Middle East.